How many dimples on a golf ball? How many dimples are on a golf ball? Find out below. One of the most frequently-asked questions by experienced and beginning golfers alike is this: how many dimples on a golf ball? It’s an obvious question, but the answer isn’t as clear. Below we answer that and lay out everything you need to know about golf ball dimples. The truth is, there is not a single answer to how many dimples are on a golf ball. That’s because the number of dimples varies depending on the model and manufacturer. Most often, the number of dimples per golf ball falls between 300 and 500. For example, the 2017/18 model of the popular Titleist Pro V1 has 352 dimples on it, while Titleist’s other flagship ball from the same year, the Pro V1x, has 328 dimples. For one manufacturer, the answer to how many dimples on a golf ball was a whopping 1,070, which happens to be the record for the most dimples on a golf ball. Golf manufacturers don’t put dimples on golf balls because it looks good. There is real science behind their use. A flat or irregular object moves through the air in an inconsistent, fluctuating manner because of how air flows over it. So golf balls without dimples would travel unpredictably through the air. Essentially, golfers would have little hope controlling a smooth golf ball. Finally, golf balls have dimples for the purpose of lift. As much as half of the lift a golf ball receives is caused by a backwards spinning motion. When a ball spins backwards, the air pressure underneath it is greater than above it, so the ball rises in the air. Dimples magnify this effect, contributing as much as 50% to the total lift. When Did Golf Balls Get Dimples? The invention of golf ball dimples happened accidentally. In the mid-1800s, the most widely-used golf balls were known as gutties, which were first created by Robert Adams Paterson using molded tree sap. When golfers inevitably dinged up these balls, they found that the damaged ones had more consistent ball flights than the new, undamaged balls. 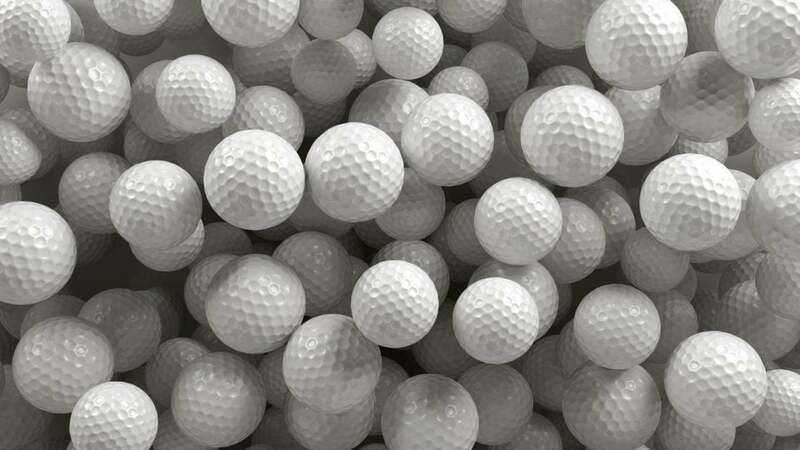 After that discovery, golf ball makers began etching raised protrusions into balls. In the early 1900s, another inventor found that indentations in golf balls performed far better than raised protrusions. In 1905, an English manufacturer named William Taylor registered a patent for a golf ball dimple design. Before long, all golf balls featured dimples that would be more or less recognizable today. As ball technology advanced, so too did dimple science. In the modern era, dimple patterns are thoroughly tested using high-tech equipment to find the optimal design for distance and control. How Big Are Dimples on Golf Balls? The size of golf ball dimples are most frequently measured by their depth. The average depth of a golf ball dimple is roughly 0.010 inch. The circumference of dimples also varies from model to model. While most dimples are spherical in shape, they don’t have to be. Callaway’s HX ball has hexagon-shaped dimples, for example. However, golf ball dimples are required to have a symmetrical arrangement, and must be within a specific range of radius and depth. How Much Does a Golf Ball Weigh? Golf ball weights varied dramatically for much of the game’s history. With older golf ball designs dating back hundreds of years, the most consistent thing about their weights, shapes and sizes was the inconsistency. But in the modern game, golf’s governing bodies have set out clear regulations for how much a golf ball can weigh. Currently, a golf ball is required to have a mass no more than 1.620 ounces, or 45.93 grams. How Big Is a Golf Ball? The general size of golf balls has a similar history to the golf ball weights. In the past, there was great variation among golf balls. But now balls are required to have a consistent size. According to the rules, the diameter of a golf ball must not be less than 1.680 inches, or 42.67 mm. How Do I Know Which Golf Ball Dimple Patters Are Right for Me? As we noted earlier, the amount of dimples on a golf ball varies greatly from model to model and manufacturer to manufacturer. Additionally, the size of golf ball dimples and the dimple pattern on golf balls is specific to each model. So which dimple pattern is right for you? The truth is, you don’t need to know which dimple pattern is right for you or what dimple pattern a particular golf ball has. It’s best to leave that decision in the hands of the golf ball creators. Instead, focus on the golf ball’s performance characteristics. For example, it’s more important to know if a ball has high or low launch performance, or if it provides a ton of spin or as little spin as possible. Many of a golf ball’s characteristics are, at least in part, a result of the ball’s dimple pattern and dimple sizes. But it’s best to pay attention to the performance specifics themselves, rather than worry about the dimple pattern that contributed to them. What Would Happen If a Golf Balls Didn’t Have Dimples on It? We’ve dipped a little bit into the physics behind how golf ball dimples work and the importance of golf ball dimples to performance. But what would happen if a golf ball had no dimples at all, or if dimples covered only part of the golf ball? Fortunately, GOLF’s equipment editor Jonathan Wall looked into this exact issue in 2014. Wall spoke with Nick Nardacci of Titleist, who had performed a dimple test for Titleist. In the test, they set up a swing robot to hit two different balls: one with dimples on just one side, and one that was completely smooth. The ball with dimples on one side produced a snap hook. The one with no dimples at all produced a low-flying knuckeball. Yo, Gear Guy! Why are golf ball brands putting weird patterns on their balls?